In a crime that disgusted Scarborough, drunk Kevin Johnson stole a World War One Remembrance flag before boasting on Facebook that “it looks mint on my wall”. But the 48-year-old’s shameful status sickened his Facebook friends, with the post shared hundreds of times as users labelled him a “tool”. The viral post brought police to his Westwood front door, yet he still attempted to hide the flag - despite posting a picture of it online on his wall. Unsuprisingly police retrieved the Armed Forces Day flag, and arrested Johnson and his girlfriend Katie Louth. She pleaded guilty earlier this month, and told Scarborough magistrates she would happily testify against Johnson if needed after he denied the charge - before leaving her alone in court while he popped down the pub. When Louth was convicted, Scarborough magistrates heard that she used a lighter to burn the hinges off the flag in St Nicholas Gardens before Johnson stuffed it in his bag after a seafront bender. 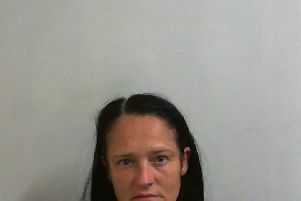 Louth, 25, of Grosvenor Road, was given a suspended jail sentence for a crime she claimed had “been blown out of all proportion”. Johnson claimed the £60 flag - depicting soldiers along with the line ‘Never to be forgotten’ - had been stolen by her only and he just put it up. But as the flag was returned both were charged, and at York Crown Court heard Johnson had previous convictions for theft and criminal damage. Defence barrister Rob Stephenson said the vast majority of the father-of-one’s convictions were from the 1980s. But Judge Stephen Ashurst told Johnson: “Armed Forces Day is a very special occasion in Scarborough for people to show their respect for those past and present from the armed services, many of whom lost their lives. “What you did was not only selfish and unlawful, but you were inconsiderate and disrespectful to those who the flag was there to commemorate. The black and white Armed Forces Day flag on Scarborough promenade before it was stolen by Katie Louth. See Ross Parry copy RPYFLAG : A drunken lout stole a World War One Rememberance flag before posting on Facebook - 'it looks mint on my wall'. Shameful Kevin Johnson, 48, was collared by police after his post was shared hundred of times on the social networking site, with sickened users labelling him a 'tool'. Johnson was arrested alongside his girlfriend Katie Louth, 25, who pleaded guilty to stealing the flag earlier this month. Louth told magistrates at Scarborough Magistrates Court, North Yorks., she would happily testify against Johnson after he initially denied the charge - blaming her for the whole incident - before leaving her in court too go down the pub. Johnson was given the same sentence as Louth - a four-week jail sentence suspended for 12 months, with 180 hours’ unpaid work. He was also made to pay a £900 court charge. Prior to his court date, Johnson said he would regret his actions for the rest of his life - adding he’d plead guilty as he was “bang to rights”. But when it came to entering a plea, he denied everything - with Louth claiming he had dropped her in it. Now he’s been convicted, event organisers, military veterans and even his girlfriend have slammed a man they claim is nothing more than a “coward”. “His actions were absolutely disgusting,” said John Anderson, from Scarborough’s British Legion. A member of the Armed Forces Weekend steering group, he discovered the theft on the Saturday morning prior to the crowds arriving. Kevin Johnson, 48, who stole a commemorative flag for Scarborough Armed Forces Day, leaving Scarborough Magistrate's Court. See Ross Parry copy RPYFLAG : A drunken lout stole a World War One Rememberance flag before posting on Facebook - 'it looks mint on my wall'. Shameful Kevin Johnson, 48, was collared by police after his post was shared hundred of times on the social networking site, with sickened users labelling him a 'tool'. Johnson was arrested alongside his girlfriend Katie Louth, 25, who pleaded guilty to stealing the flag earlier this month.Louth told magistrates at Scarborough Magistrates Court, North Yorks., she would happily testify against Johnson after he initially denied the charge - blaming her for the whole incident - before leaving her in court too go down the pub. Mr Anderson helps to organise the festival alongside others including John Senior, who started the Heroes Welcome. “Armed Forces Day is about honouring courage and bravery, like those in the flag who fought in World War One,” he said. In an interview we’ve been unable to print until now due to legal reasons, Johnson said he has family in the army - and hadn’t realised it was Armed Forces Weekend. “I was just stupid - anybody who knows me knows I would never do anything like this deliberately, it’s just not me, they know I’m just a nutter. “It was a red hot day and I had been drinking - I couldn’t even have seen the woods for the trees. “I have friends and family based in Cyprus at the moment and they know better of me to think I would ever disrespect them or my country. “I was proud as punch when I took the picture but now I’ve sobered up I just wish it had never happened, not in a million years. He also handed over a letter of apology to Scarborough, which he signed off by saying “with big regret, Kevin Johnson”. But after leaving her to face magistrates alone, his girlfriend was less than impressed - using an unprintable slur to sum up his actions. The flag’s owners Scarborough Council declined to comment.